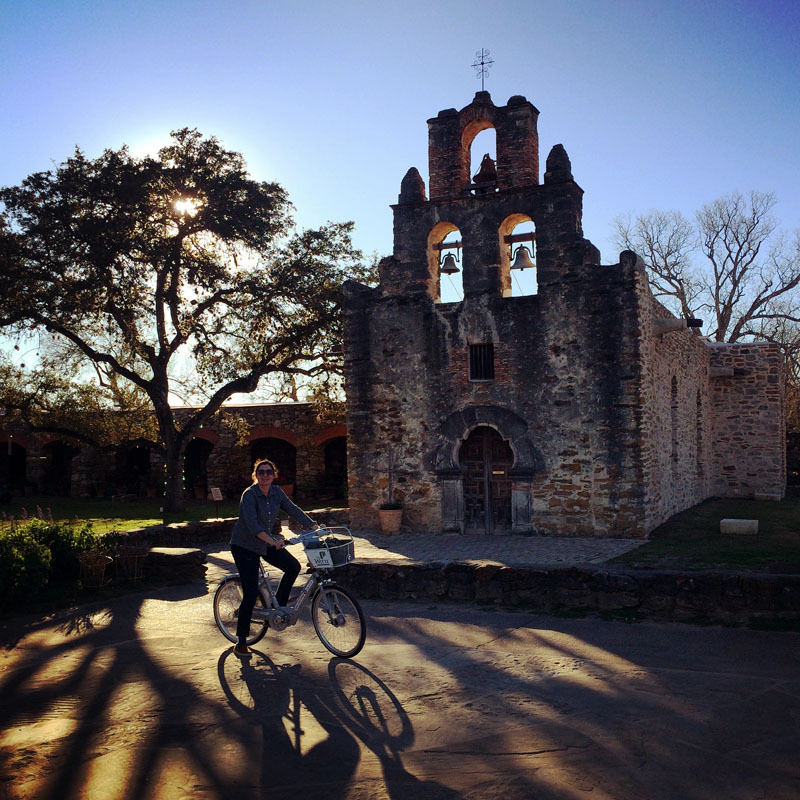 After dropping our kids at their grandparents’ house one morning, my wife and I drove to downtown San Antonio intending to bike to Mission Espada and back, primarily along the Mission Reach (see sidebar below). 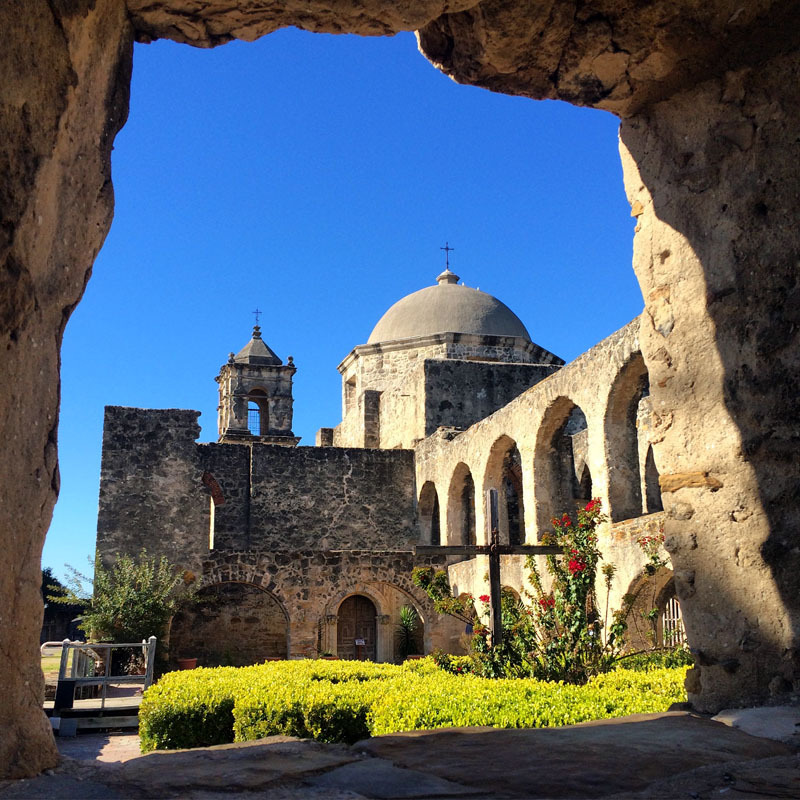 The 20-mile round trip connects the Alamo with the four southernmost missions. 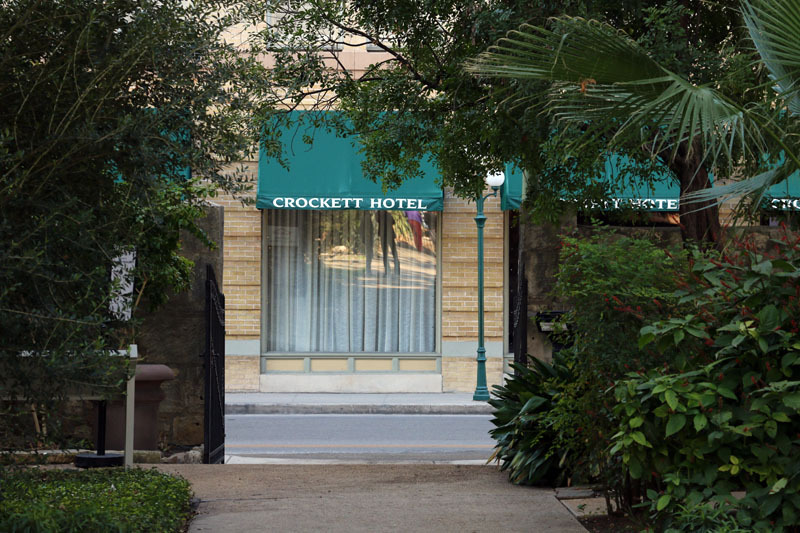 We checked in early at the historic Crockett Hotel, and immediately walked to the nearest BCycle station off Alamo Plaza. 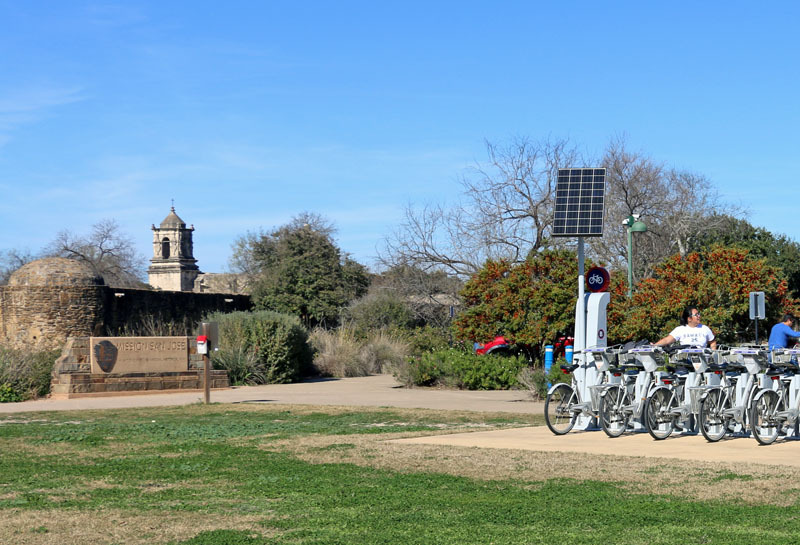 BCycle is a bike-sharing venture allowing people to rent and return bikes at dozens of stations at popular central San Antonio destinations, including the missions. We purchased a $10 day pass that included unlimited 30-minute rides. If we exceeded 30 minutes, we’d be charged $2 for each additional half-hour, but we assumed we could avoid that by renewing at the many stations along the route. We knew it would be tight and we wouldn’t have much time at each mission, but based on past road cycling experience, our agenda seemed doable. One thing we didn’t count on was the bikes, which are built for comfort, not speed. We set off in late morning at a leisurely pace, rolling past the historic La Villita, a Payaya Indian settlement occupied by the Spanish in 1691, and the King William Historic District. 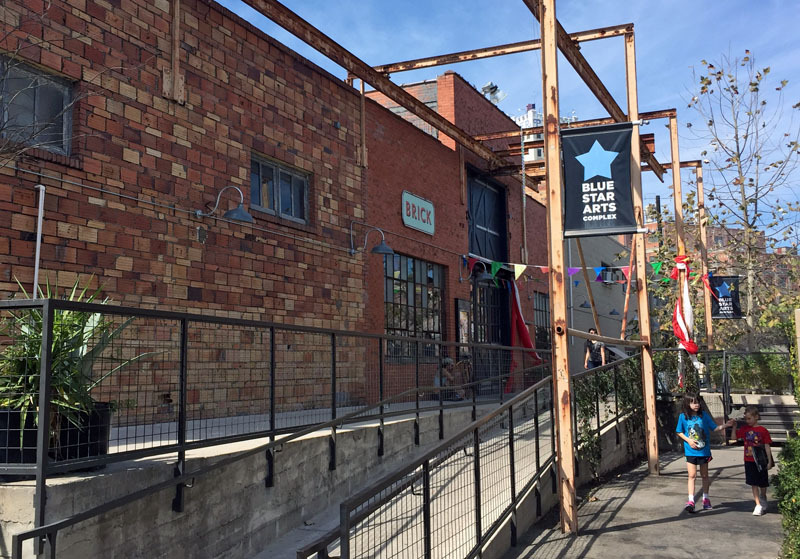 Our lunch stop was the National Register-listed Blue Star Arts Complex, which has a BCycle station. We easily made it within the half-hour, and strolled through the former railway warehouses that now contain funky boutique shops, art galleries, and eateries. We settled on Stella Public House, where we shared an exceptional small pizza and salads. Sufficiently fueled, we hit the trail again, continuing south toward Mission Concepción. Once we passed the Lone Star Brewery, we knew we were getting close but soon nothing looked familiar. We pressed on, but eventually stopped to ask for directions. A helpful local confirmed we had passed Concepción and nearly reached Mission San José. So we continued south, assuming we could catch Concepción on the return. A wedding at San José reminded us that the four mission churches are active Catholic parishes. 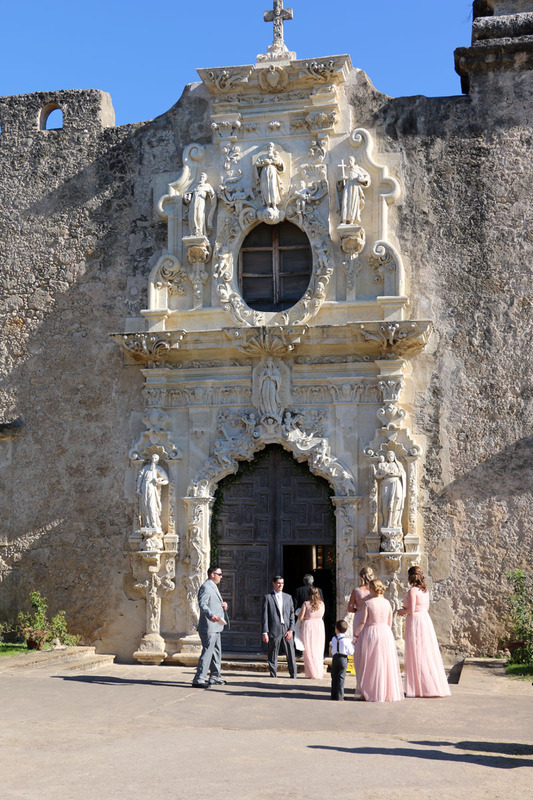 With the chapel closed to the public and bridesmaids in dusty rose-colored dresses gathered at the renowned rose window, we strolled through the convent and grounds, taking in the magnificent baroque architecture and reading interpretive plaques. 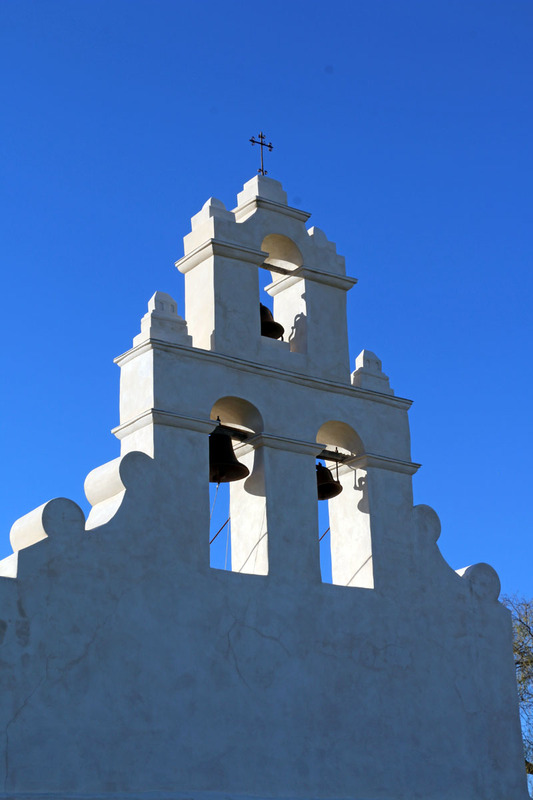 The largest of the four missions, San José (aka the “Queen of the Missions”) was founded in 1720, and the current church was completed circa 1780. Most of the mission’s buildings were reconstructed or restored in the 1930s by the Works Progress Administration. A recent restoration project was completed in 2015. It included stabilization and rehabilitation of the intricate stone carvings on the front of the church, stabilization and restoration of the rose window, landscaping in the convent’s courtyard, and interior plaster repairs. 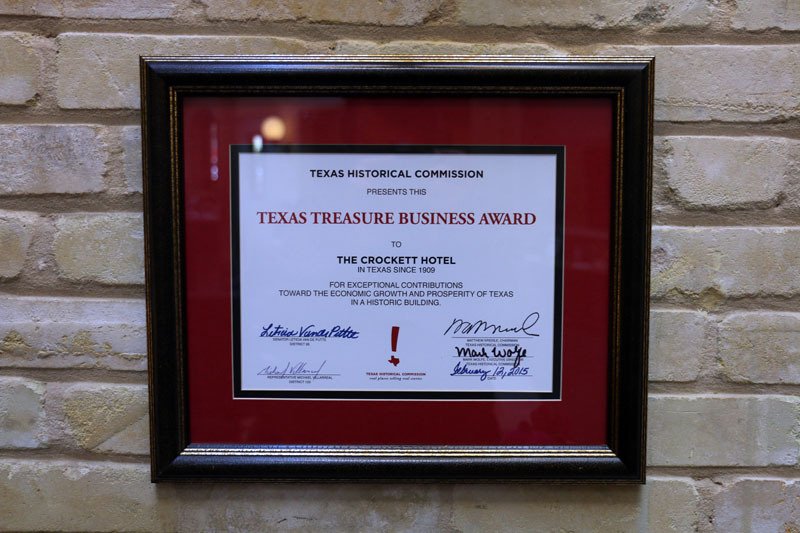 Restoration work was done at all four missions by architecture firm Ford, Powell & Carson, a THC Texas Treasure Business Award recipient. 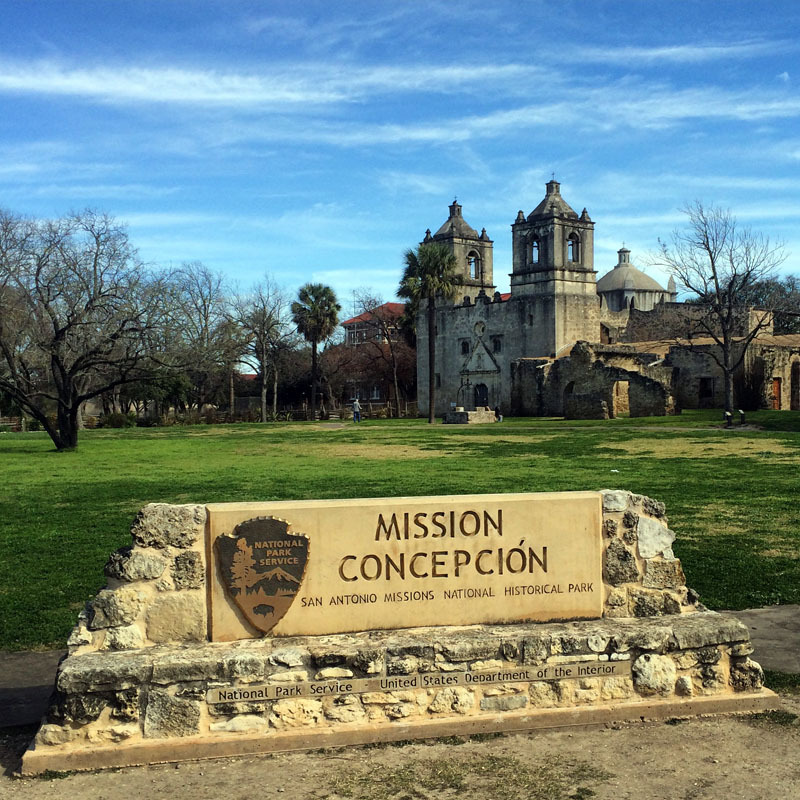 The THC also awarded a Texas Preservation Trust Fund planning grant for a post-restoration conditions assessment at all four mission churches. Back on the trail, we headed south past Acequia Park to Mission San Juan Capistrano. The first thing I noticed was the chapel had been limewashed since I last saw it. 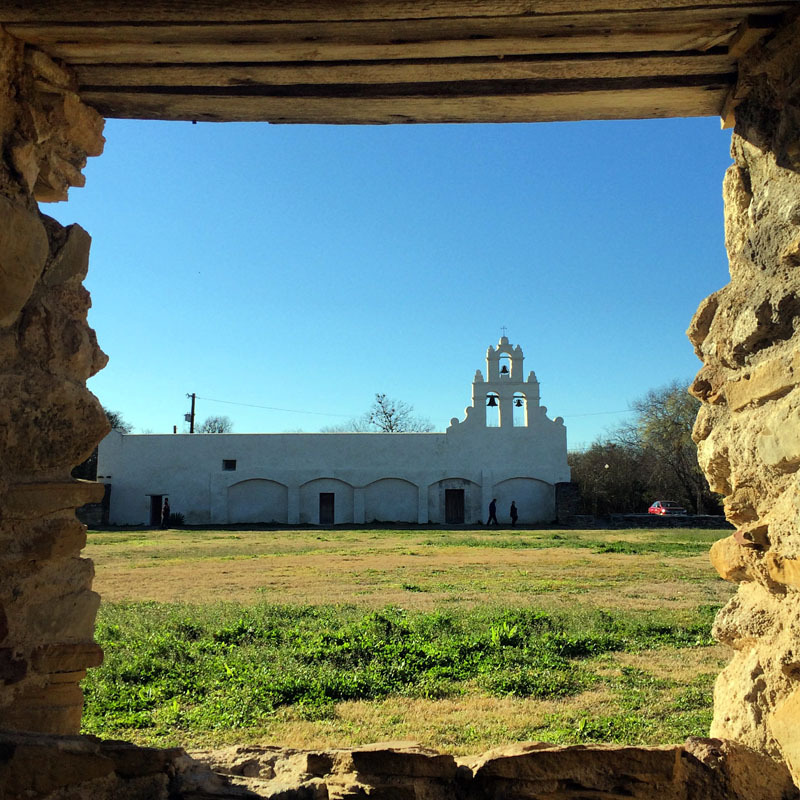 The gleaming white façade was a bit jarring compared to the noble weathered look of San Antonio’s other missions, but then I remembered it’s not unlike the missions in El Paso and other states. The limewashing followed extensive repairs to the 18th-century church, including stabilization and underpinning of the stone walls, below-grade waterproofing, and an interior rehabilitation. With the afternoon waning, we had to hustle. We couldn’t find signage directing us back to the River Walk trail, so we opted for the more direct route to Mission Espada along Villamain Road—which fortunately has a bike lane and little traffic. Espada is comparable to San Juan in some respects: the mission complexes are smaller than their northern counterparts, and they feature similar bell towers. Espada’s preservation work has included interior plaster restoration, and masonry repair and stabilization of the church and priest quarters. After a quick stop at Espada, we found the trail back to the River Walk and began our northbound push. We made it as far as Acequia Park before conceding we were running out of daylight and would have to pass on Concepción. We parked the bikes at a BCycle station and hailed an Uber driver, who informed us he often picks up people who get to Espada and don’t have time or energy for the return. But that was not the end of our mission sightseeing. The next morning we explored the Alamo grounds, chapel, and museum before driving to Concepción. We quickly walked the grounds and admired the 1755 church, the site of an October 1835 battle where Texian forces led by James Bowie and James Fannin repelled the Mexican army. In recent years, the church has undergone façade stabilization, conservation of the south tower, and plaster conservation. Although it didn’t go as planned, our whirlwind tour was an adventure. We ended up spending $12 each for the bikes (missing Concepción caused us to exceed BCycle’s 30-minute deadline once). Our final assessment: doing it all over again, we’d leave earlier and allow extra time for wayfinding and exploring. And we might even call Uber again. There’s still a misconception of the River Walk as a commercialized downtown tourist attraction, but that reality changed in 2013. The completion of a major expansion and revitalization effort utterly transformed the world-famous trail. Now spanning nearly 15 miles, the River Walk is comprised of (north to south) the Museum Reach, Downtown Reach, Eagleland Segment, and Mission Reach. 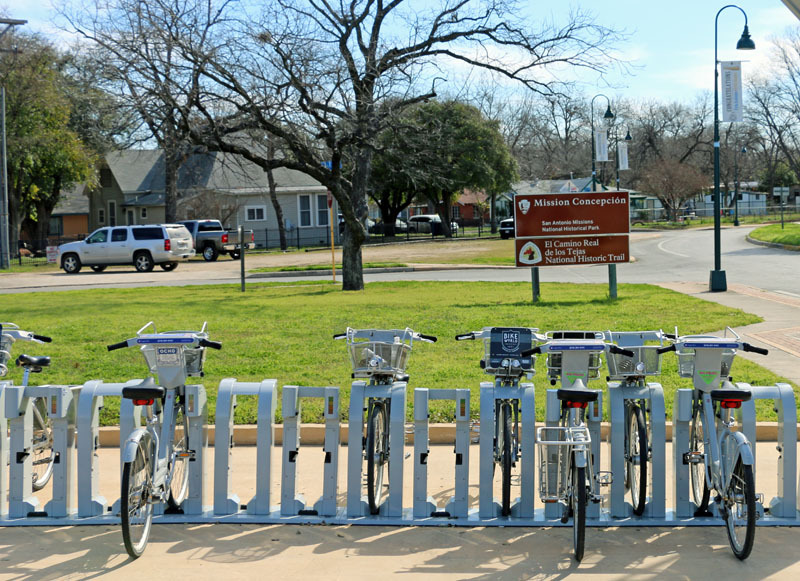 Outside downtown, most of the route is unrecognizable from the original River Walk—it’s largely a non-commercial hike-and-bike trail along restored river ecosystems connecting parks, historic sites, and museums. Notable aspects include public art installations, interpretive signage, native landscaping, wildlife, and local use of the trail for fitness and recreation. 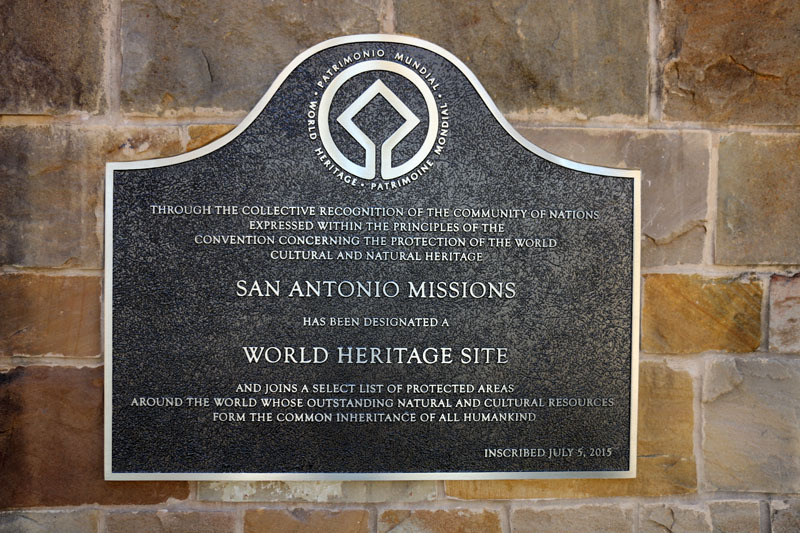 With last year’s UNESCO World Heritage designation of the San Antonio Missions—the first Texas sites to receive the distinction—more tourists will visit the Alamo City, and many will want to combine heritage tourism activities with cultural excursions and outdoor recreation. The San Antonio River Walk enables that.